In Bodhgaya, as the sun slowly rises just before six in the morning, the brown-black water buffalo and the multi-colored baby goats down the street from the Monlam are posted with ropes methodically eating straw. A woman sweeps in front of her house. White and beige tour buses slow at the speed humps and honk twice signaling to the bicycle rickshaw drivers and the e-rickshaws, the environmentally friendlier electric transport. 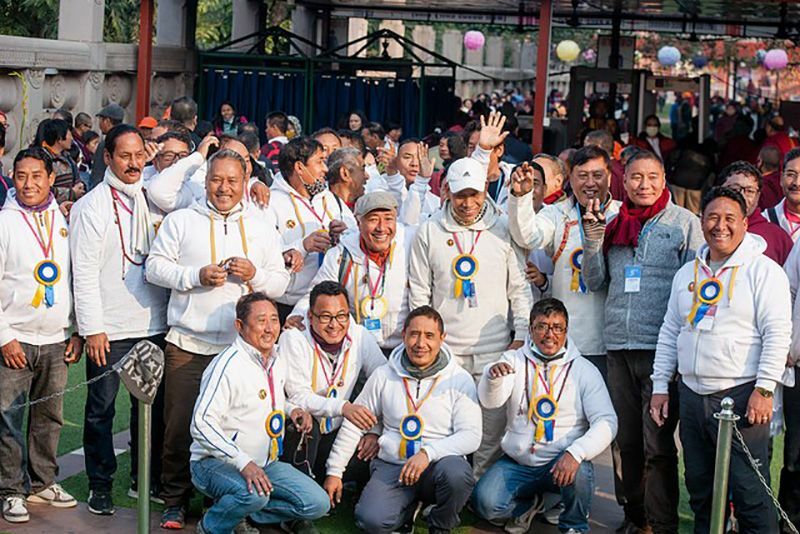 The passengers, often dressed in white to symbolize the purity they intend to cultivate while holding the eight precepts, head to the Kagyu Monlam pavilion where the melodious sound of chanting begins, carrying all the way across the lush, green rice fields of Bodhgaya. 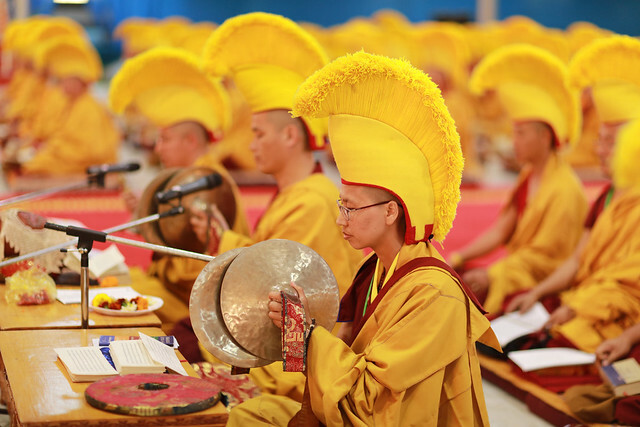 This year there is another distinctly pleasant addition to the lyrical prayers, the sound of female chant leaders, umzay, alongside the two male leaders. As Tsünma Tsultrim Tsangmo and Tsünma Khyechok Palmo, two of the umzays explain, the Tibetan word dbu pronounced “ŭ” means ‘first,’ and mdzad prounounced “zay” means ‘to do.’ They alternately detail how umzay means ‘the first to do’, but in this sense, it refers to ‘those who lead the chants’, guiding the other monastic and lay devotees in the prayers of the Kagyu Monlam book. 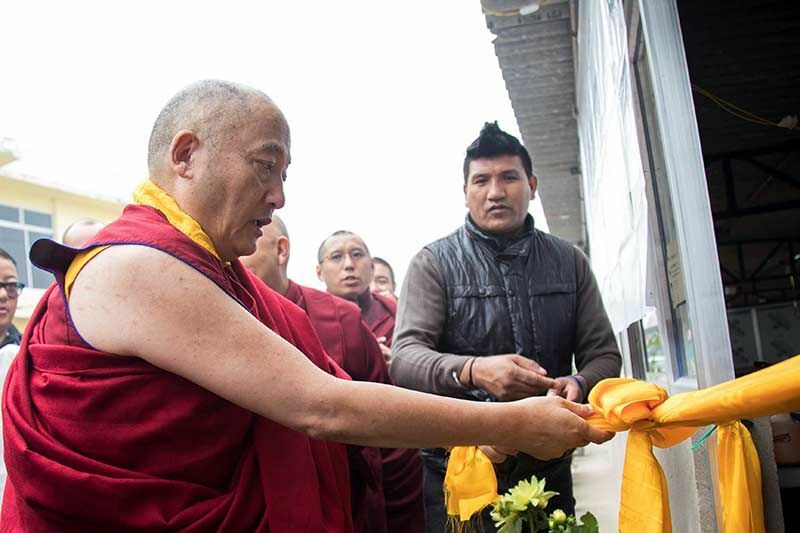 Tsünma Tsultrim Tsangmo of Thrangu Tara Abbey in Nepal, Tsünma Kheychok Palmo of Karma Drubdey Palmo Choskyi Dingkhang in Bhutan, Tsünma Jampe of Gyegu Dagmo Choling in Sikkim, and Tsünma Yangchen of Karma Drubgyu Thargay Ling near Dharamsala, India, with the blessings of His Holiness and under his request are accompanying the other male umzays. They lead the Monlam in alternating pairs rotating between one as the lead umzay and the other as accompaniment umzay. Leading chants is not a new role for them as these four nuns have been umzays at their respective nunneries as well as during the previous four Arya Kshema Winter Gatherings for Nuns. 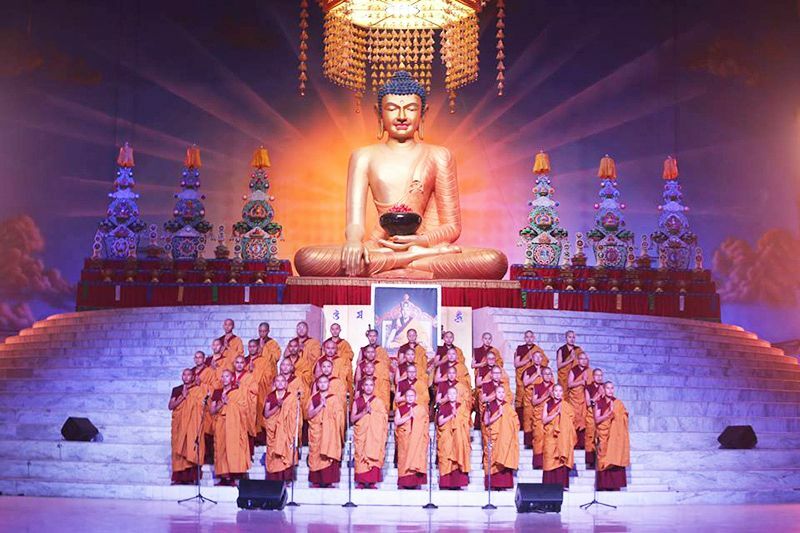 They explained that in 2009 under the guidance of His Holiness, thirty monks and thirty nuns from different monasteries began practicing all the melodies together. 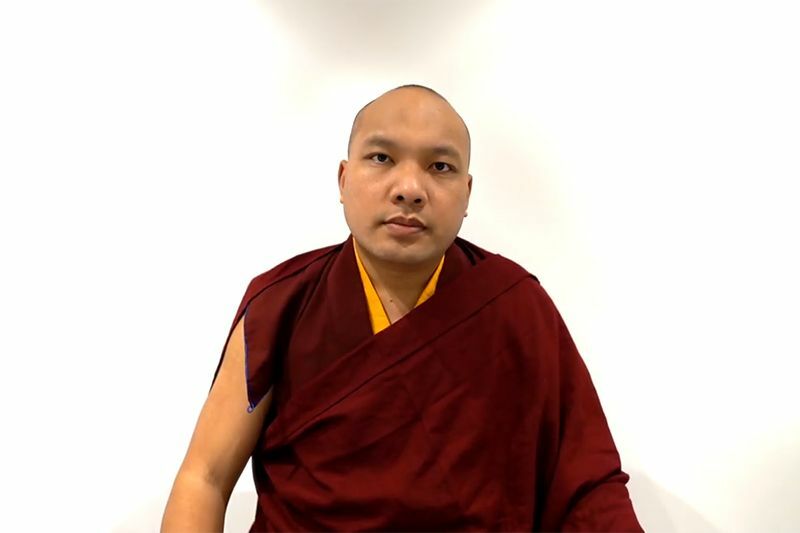 Khyechok Palmo said, “It was His Holiness’ vision for us all to learn the new melodies that he composed.” Tsultrim Tsangmo added that the music is like “a treasure of his mind” and unlike original music because it has blessing power. 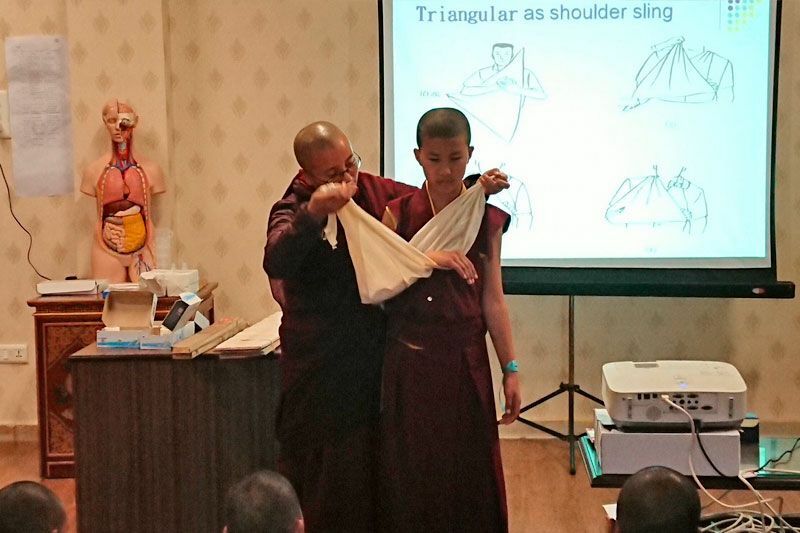 Even more of a blessing is the Kagyu Monlam prayer book, which is composed in Tibetan and translated into eleven different languages so that all the international devotees can recite His Holiness’ melodies that are paired with each prayer.